Less than an hour south of Manchester Airport, and based in the World Capital of Ceramics aka Stoke on Trent, The World of Wedgwood brings alive their history and heritage in an inspiring, sophisticated and elegant way. 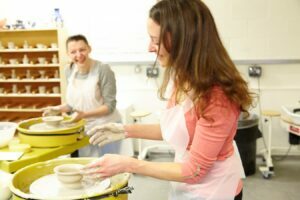 Their visit will include a factory tour that gives an in-depth view of all aspects of quality ceramic production including casting, figure making, pattern decorating and hand painting, ornamentation and gilding. I’ve added a fun hands-on experience and time to talk to the master craftsmen and women, a light lunch in the Wedgwood Tea Room and time to shop ‘n’ ship in their Outlet and Flagship stores. 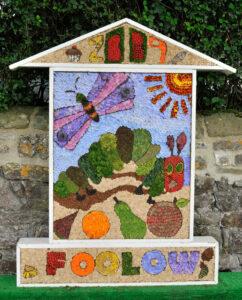 Derbyshire is famous for its Well Dressings, an ancient spring through summer tradition when villages create magnificent floral displays which give thanks for the supply of pure water. Huge wooden frames containing a bed of moist clay are decorated with intricate pictures using petals, seeds, bark and other natural products. I’ve included a hands-on opportunity and because roses will be at their peak at this time of the year, I’ve added a fragrant late afternoon visit to a private garden which will be ablaze with colour. I’ve also added a special tour of Notty Hornblower’s unique Costume Collection. 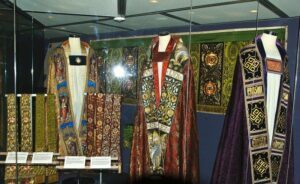 The city of York is their base for 3-nights and because of their interest in textiles, I’ve set up a special tour of the Minster. It will be led by one of the embroidery/textile enthusiasts and specialists who care for their extant collection of textiles, who are responsible for conserving and creating new pieces for use in the Minster. It will be followed by a visit to the Broderer’s studio, where the Minster’s archives and library are kept and it’s where they will be able to talk to them about their invaluable and highly skilled work. York is the headquarters for the Quilters Guild of the British Isles. Because I now have plenty of notice, I can book a Behind the Scenes visit (by appointment only) which includes a handling session with historic quilts from their heritage collection and a rare chance to glimpse the collection treasures which are not on display to the public. 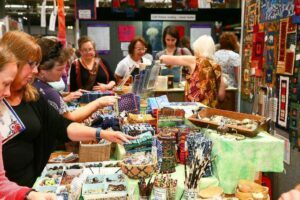 From York, they will then head to Birmingham where they will rub shoulders and make new friends among the many quilters attending the 4-day Festival of Quilts. Can you think of 6 contacts who might go for something like this? 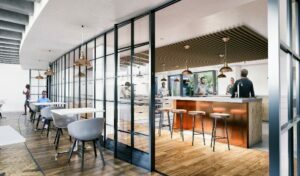 Talking of York, if you have clients who are into Foodie Tours, the early March 2019 opening of the new cookery school at the luxurious 5-star Grand Hotel, offers an imaginative range of half and full-day courses which can be worked into a York-based 4-night Gourmet Tour. To expand the potential, add a Chocolate (Tasting) Tour of the city, a gastronomic lunchtime sampling/walking tour of nearby Malton, Yorkshire’s Food Capital (come hungry! ), visits to local artisan food makers, and a tour and tasting at Yorkshire’s most northerly vineyard. To complete the experience, there’s a gastro pub lunch, a sampling at a local monastery and a visit to a local dairy for an ice cream and cheese tasting. No visit to York is complete without a trip to Betty’s famous Café Tea Rooms on St Helen’s Square, where the beautiful interiors were inspired by the Queen Mary ocean liner. In 2019, Betty’s celebrates 100 years of delighting customers with delicious handmade cakes, mouth-watering chocolates and aromatic, exclusive coffees and fine teas. Throughout the year, Betty’s will celebrate this landmark birthday a series of 14 events in their 6 Yorkshire branches, including celebratory cookery school courses too. 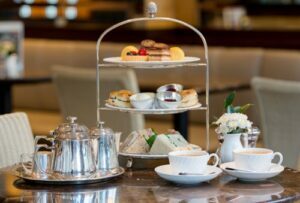 Add this unique experience to the York Gourmet Tour and time the visit to coincide with the annual York Chocolate Festival (19th-22nd April) or York’s 10-day Food Festival (20th-29th September).